Well. 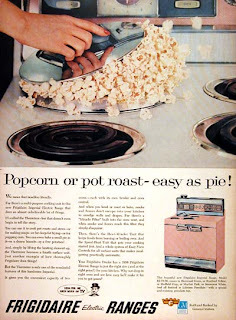 This doesn't look quite right to me, but perhaps in 1956 having popcorn erupt all over the stovetop was quite the rage. It's spewing forth from a cooking cavity that was purported to be more convenient—more modern—than simply putting a pot on the burner. Note that the appliance was 'built and backed' by General Motors. That may explain everything. We had a similar stove in the early 1950s, a different brand and far less grandiose, but with a pot insert like the one gushing popcorn. My mother tried and tried to find a use for it. Eventually, she just pretended it wasn't there. You had to use the exact pot that came with it, and she was very fussy about the pots she used. Eventually, it disappeared. The stove came with the house, but I'm sure the pot feature was a big selling point. It reminds me of the neighbors a few years later who installed a blender in their kitchen counter. Built-in blenders were all the rage for a while, but they were the very first. The problem was that this early model wasn't flush. If you weren't careful, bottles and glasses fell over. Also, the motor took up half the cabinet below, which meant they were constantly banging things into the box. In constant dollars, you could buy several hundred blenders today for the price they paid, and your neighbors would be equally amazed. I doubt, however, they would be envious. A well deserved dig at GM. I feel for your mother; there's nothing like being thwarted by a stupid major appliance. In our house, a Frigidaire Flair came with the kitchen. I remember being fascinated by the 'drawer', wherein the electric coils were concealed. It had a satisfying heft to it—at least for a child—when pulling the cooktop out for use. Thanks for sharing your stories, Evan.